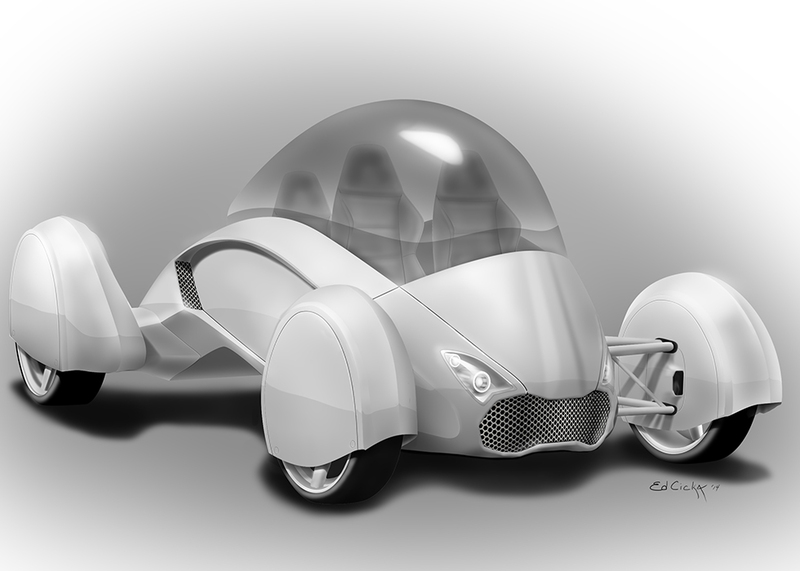 The UNIVERSAL-MOTION Citsport Concept Vehicle is one of many transportation ideas that come from the creative minds of UNIVERSAL-MOTION designers and engineers. 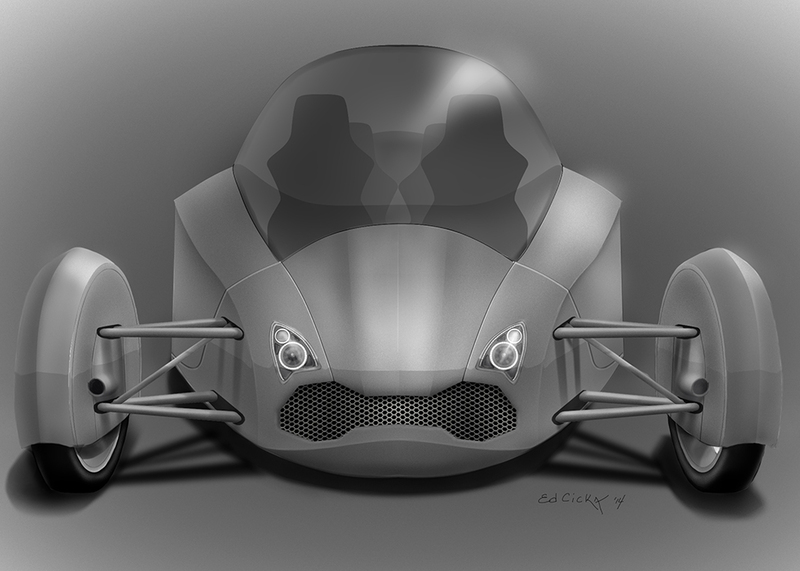 The concept was formed from the brief to create a unique and fun road vehicle that would fit two adults and two children and use the new UNIVERSAL-MOTION Trillian oxide battery system. The hyper long discharge battery can put out a consistent flow of power until it is almost drained flat, only dropping off in the last 98% of battery life. Couple this battery with the proven UNIVERSAL-MOTION high torque electric motors means that long distance, battery powered travel is no longer a dream of the past. The Citsport has other innovations, such as fully electronic control systems, heads up displays, reverse and parallel parking assist, and dynamic road correction suspension. The unique shape of the Citsport means that the driver has a commanding view of the road, without the loss of aerodynamics. The monocoque body made from composite materials is extremely stiff for better road holding, but still provides enough dynamics to dampen road imperfections. 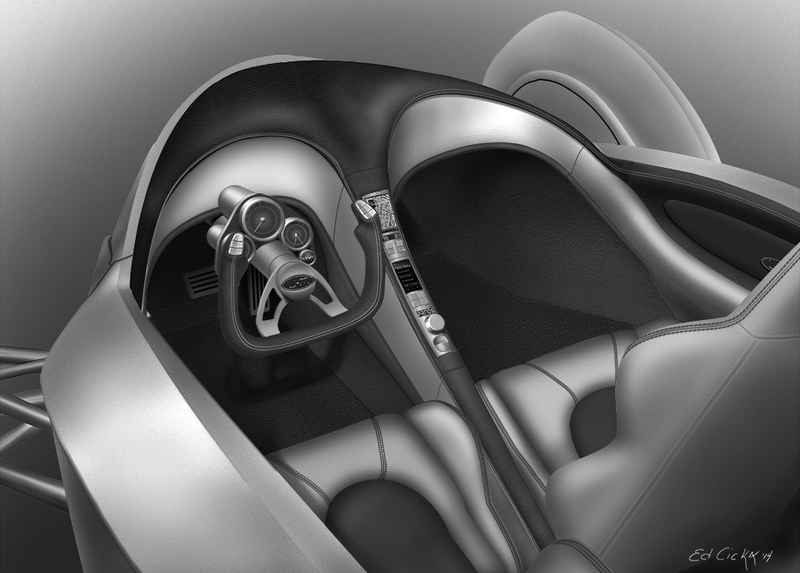 Although it may be several years before you see the Citsport at a UNIVERSAL-MOTION dealer, the ideas being proven in this concept car will be in many cars of the very near future. In this project, I wanted to focus on using Photoshop through the ideation process. Photoshop is an amazing tool for rending as well photo manipulation. Using a WACOM Cintiq pen monitor makes the rendering process very quick and natural. I incorporated the use of paths and layers to achieve the effects that I would gain from using masks, curves and an airbrush in traditional media. I first started by doing several rough profile sketches until I got a shape that I liked. I worked the shape over and over, refining it until I had most of the details worked out. I really liked the waspish shape of the body with the non-integrated fenders with skirts. I've always liked clean look of wheel skirts. Once I worked out the details, I started on the car's profile. Working over the rough sketch, making heavy use of paths and layers, I created templates of each of the major body sections. These I use later as masks while using "airbrush" type brush techniques. The wheels and tires were created earlier and are a "stock" item I have in my portfolio. This allows me to "kit bash" to saved time. Once I finished the side view, I started on the front view. 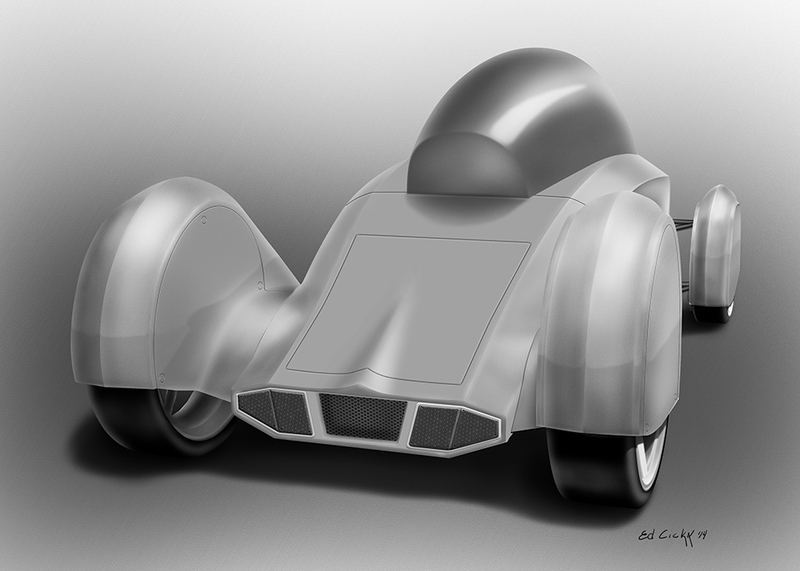 This was very difficult because I had not work out how I wanted the front of the car to look in the side view. I did quite a few preliminary rough sketches to work out the shape. I also used a lot of reference pictures to get some ideas of what I wanted. I settled for the grill and headlight option seen in the front view and removed the headlights from the front fenders that are on the side view. The front of the car is very important for the overall theme of the car, and it is very important to get it right. I really like what I settled on. After nailing down the front view, I decided to do the 3/4 view. The shape of the car made the 3/4 very difficult to get right in a perspective rendering, so I spend a few hours creating the body/fender shapes in Blender then rendered them at a 60 degree view. I used that as a reference to develop the 3/4 view rendering in Photoshop. The 3/4 view was followed by a rear view to get an idea of how I wanted to back presented. I used the Blender model again, this time rendered from the back to get the perspective correct. I removed the tail lights from the fenders and put them into the body along with a central vent for the motors. The trunk/engine access lid is pretty plain but I wanted to maximize access to both areas of the car. I realized after I finished the car that the tail lights look almost like a Lamborghini Countach. Oh well! Good design never goes out of style! Now that I had all the body views done, it was time to focus on interior. I didn't quite know how I wanted the interior to look. I worked on several rough designs but couldn't quite nail down what I wanted. 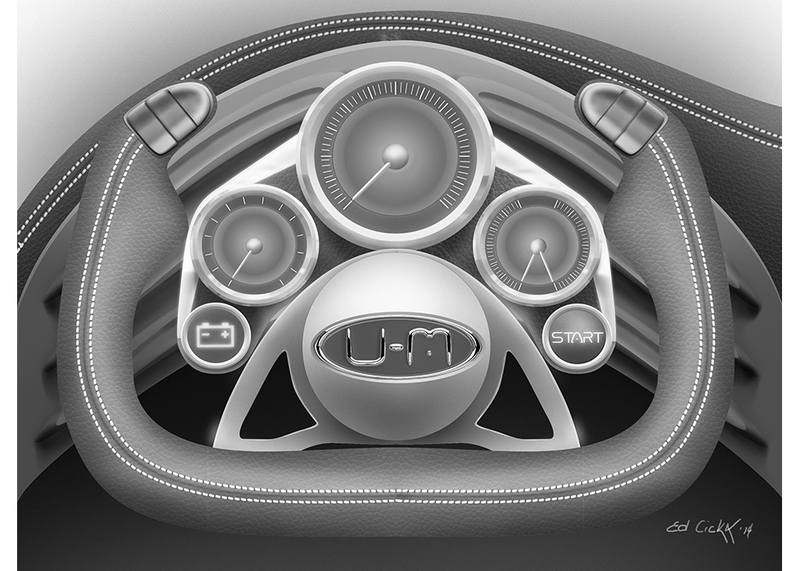 To help with the design, I decided to focus on the steering wheel and instruments. I figured once I had those, I could use them to finish off the design. I looked at a lot of picture references and decided that I wanted an airplane style wheel with an instrument cluster mounted to the column. I did a detailed drawing to get a feel for how everything would go together. Once I had that, the rest of the interior fell nicely into place! 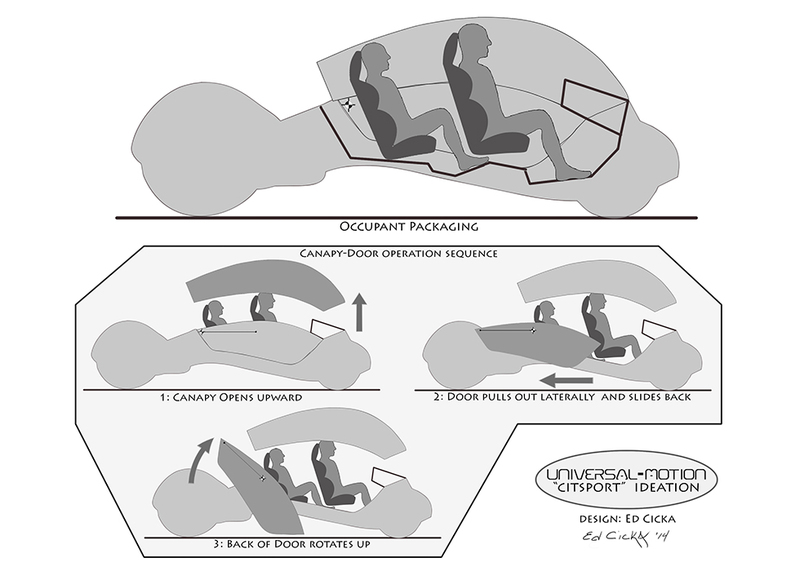 The final bit of work was a "packaging" exercise to determine how the passengers would fit in the car, as well as how the door and canopy would work. The door functionality was quite tricky because I had to figure out how to open the doors and canopy without going too high above the car. I made several "templates" in Photoshop and moved them around the outline of the car until I found a way to open the car up without taking too much room. The doors are very unique. I don't know of any other car that has tried this before. I know it wouldn't pass current DOT requirements, but that's the joy of designing for the future. Who knows what the requirements will be!